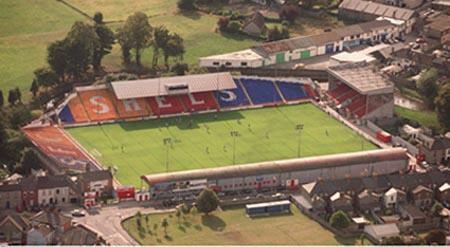 Shelbourne play their home fixtures at Tolka Park in Drumcdonra. Image Credit: Wikimedia Commons. Shelbourne FC will bare the logo of DCU on their jerseys next season as the League of Ireland First Division side have announced a partnership with the university. As part of the deal Shels will offer DCU students and staff a 10 per cent discount on season tickets for their Tolka Park home games. DCU advertising will also be present and prominent around the Drumcondra ground. “The exact discount varies based on which season ticket option is purchased,” the club stated. A statement from the university read that player development and a link-up between the college soccer system and the Shelbourne sides would be implemented. It read: “The partnership aims to develop a broad range of initiatives which will enhance sporting excellence within both organisations: player development at Shelbourne FC through access to DCU coaching, specialist facilities etc, player development at DCU through pathways onto Shelbourne FC teams, scholarships for gifted soccer players wishing to develop their sporting talents whilst accessing a first-class education, joint community engagement initiatives in the region, [and] the Harding Cup (a major tournament for first year University students) is hosted by DCU this year and the final will take place in Tolka Park. Shelbourne chairman Joe Casey was glowing after the announcement, saying: ““DCU’s sponsorship and the potential for a wider partnership is a significant development for Shelbourne FC. Professor Brian MacCraith said of the partnership: ‘‘We are proud to be involved with a club with such a distinguished history as Shelbourne FC. The Drumcondra club play their home games just a short walk away from the DCU St. Patrick’s Campus, and Tolka Park recently held the finals of the Harding Cup Freshers football tournament that was hosted this year by DCU. Readers of The College View will be able to enjoy reports from Shelbourne’s competitive fixtures in the near future.